The World Needs a Savior - You! Only the strongest survive in a world torn apart by war! Fearless Commanders are already in their combat positions - join them! Fight alongside the deadly robots of Skynet or on the side of rebels - humanity's last hope. 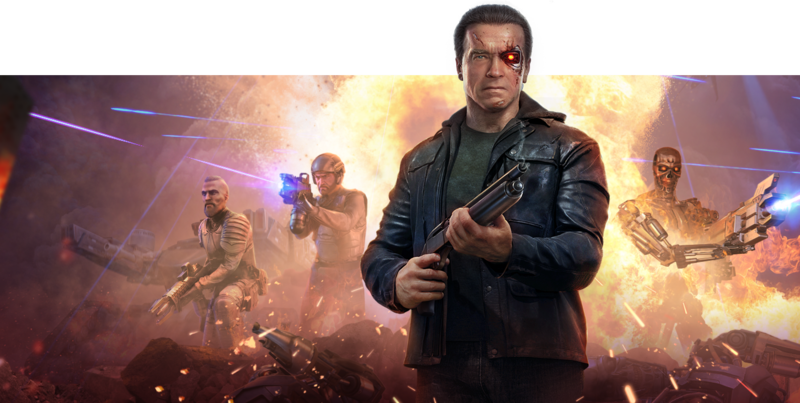 Enter the world of Terminator Genisys: Future War! The fate of this world is in your hands! War... It taught us to live in the face of death, to value help, to not see the world in black and white. Humans and machines are more alike than we knew. Who will be your ally and who your enemy? It’s your choice. Battle-hardened, they are without equal in the art of warfare. Guided by an insightful strategist, their unique skills can alter the outcome of a battle. A Commander's army will win when headed by a skillful Leader! They struck suddenly, annihilating humans and machines alike. But the enemy forgot one thing - war has become a part of us. We live for conflict and await the final battle that will crush the deadly Aggressors! Survival is impossible for those who find themselves alone in this world. Without allies, the enemy's relentless attacks can break through any defense. The future belongs to those who have one thing: Clan unity!